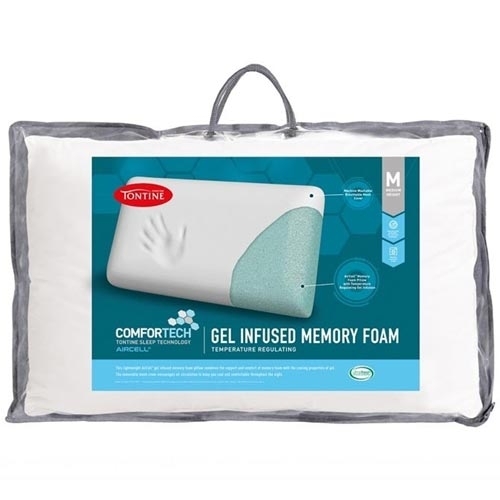 This lightweight Aircell™ gel infused memory foam pillow combines the support of memory foam with the cooling properties of gel. The removable mesh cover encourages air circulation to keep you cool and comfortable throughout the night. It's so hard, doesn't support my neck on my side nor back. Such a waste of my hard earned money. Bought this pillow since I have trouble sleeping at night and coz I get too hot regardless if it's freezing cold outside. If I don't account for the supposedly cooling factor, this pillow is relatively comfy to sleep on. Hence the extra star. Now if I put the cooling factor into account it's not so great. I last maybe 5 minutes on my side before I have to toss and turn or find somewhere in the pillow that isn't hot. Premium Mesh Cover encourages air circulation to keep you cool and comfortable throughout the night.